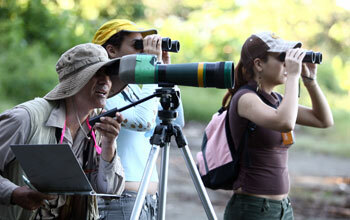 At the Hacienda La Esperanza Reserve in Manatí, citizen scientists explore the unique plants, animals and ecology of one of the few coastal forests that exists on the northern coast of Puerto Rico. The Citizen Science program is led by expert scientists and provides hands-on learning volunteer opportunities that contribute towards overall environmental research and restoration, such as native plant reforestation, endangered and threatened species, support and hydrological studies. To learn more about upcoming Citizen Science projects, click the "Citizen Science" tab on the Hacienda La Esperanza home page at http://www.fideicomiso.org and watch this video http://vimeo.com/21674116.